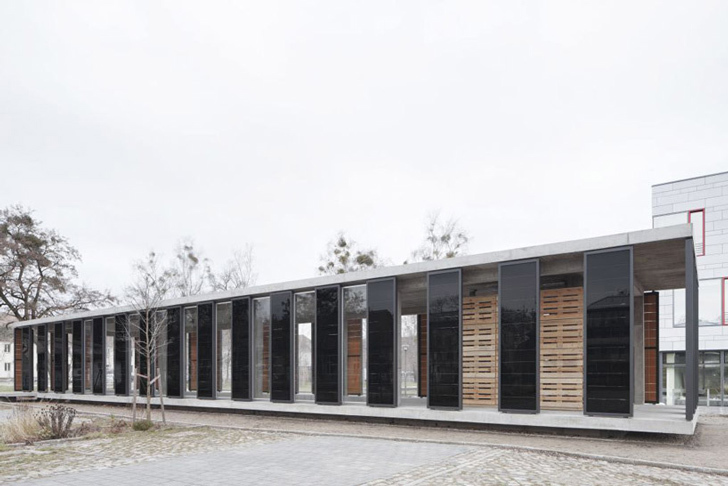 A pavilion on the campus of the University of Applied Sciences Potsdam, Germany provides shelter behind a wall of solar panels. 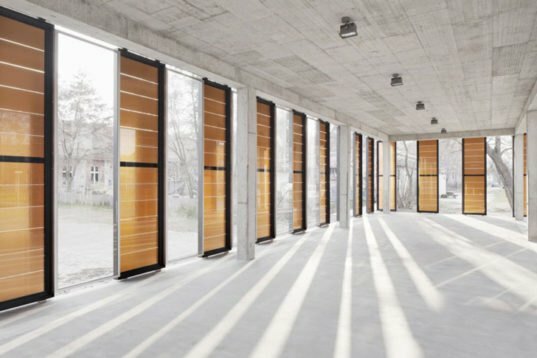 The visually striking design by Austrian architecture firm Ortner + Ortner demonstrates the design power of using photovoltaics as a core visual element. The one-meter by four-meter panels stand straight up 1 meter apart, giving the 35-meter-long space a much larger visual presence and making it a distinctive gathering place on campus. If you noticed that the layout of the panels is anything but optimized for energy production, you would be right — at first glance the orientation is indeed a disaster. The panels are made from thin-film technology, which (unlike traditional silicon crystalline-based solar panels) tolerates shade and is more productive in indirect light. Ortner + Ortner took that as a license to push the design logic of the layout and provide an immersive experience. The strong vertical elements set in a horizontal plane echo a classical building facade. Glass is subtly placed in the center of the pavilion for better protection from the elements, but it does not disrupt the visual pattern. The panels appear to be pitch black from the outside, but they have a surprisingly soft brown hue when backlit by the sun. Wires are tucked into the frame, giving the technology a light visual footprint – untrained eyes might easily overlook them. Another nice trick is the way the roof seems to be supported by the panels from outside. While they panels may look fragile, they were custom produced by Odersun using four panes of safety glass with the thin-film solar sheets sandwiched between.